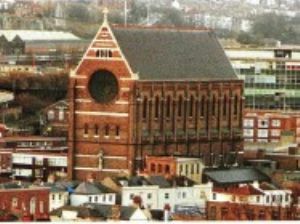 Aspect of St Bart's prior to the housing development. 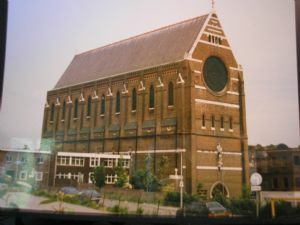 the Community Use of The Church - and much more. 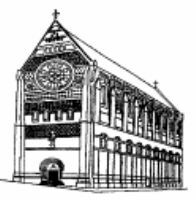 A copy of the Parish Profile in pdf form can be downloaded by clicking here. To maintain the musical tradition for which we are well known, we urgently need more singers. Our vast repertoire of Viennese Masses is maintained through a single rehearsal of just over half-an-hour before our Sunday morning High Mass. Singers must be capable sight-readers, able to take copies of the music away and do thorough homework in preparation for the rehearsal. A good quality voice with the ability to sing with absolute confidence to fill the church with glorious sound is essential. WE ARE NOW IN URGENT NEED OF A REGULAR AND COMMITTED PRINCIPAL BASS/BARITONE WHO CAN CARRY THE SOLO PARTS OF MANY OF OUR MASSES AND SING THE TUTTI PASSAGES. WE WILL CONSIDER TWO OR THREE BASSES WHO WOULD COMMIT TO THE CHOIR ON A ROTA BASIS. REMUNERATION MAY BE AVAILABLE TO SUITABLE SINGERS, SUBJECT TO AUDITION. With traditional hymns and "New People's Mass" by Dom Gregory Murray. With elaborate settings of the Mass by mainly Viennese composers. 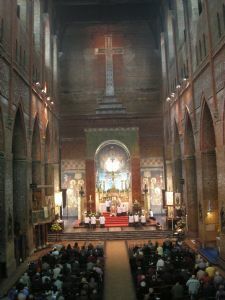 This Mass has music and liturgy for which St Bartholomew's is renowned. The music repertoire consists of over 40 classical Masses. the English Hymnal are included. Lasting between 75 and 90 minutes. Coffee and refreshments are usually served after both Masses. are as shown on the Music at High Mass page. should be visited to identify such transfers. The Angelus is said daily at noon. Regina caeli from Easter to Whitsunday.